As I checked the chip-leaders for the final preliminary event at the 2010 World Series of Poker this morning you can imagine my surprise when the 4th name down was none other than 2006 WSOP Main Event Champion Jamie Gold! Gold has never come close to reliving his incredible 2006 WSOP run still has a lot of work to do in the $2,500 buy-in NLHE tournament, but we’ve seen how adept he is at playing big-stack poker. And players like Mark Newhouse, Dan Heimiller, Victoria Coren, David Singer, Scott Montgomery, and Simon Trumper –all of whom are in the top 20 chip-counts– will likely have none of Gold’s antics at the poker tables. The tournament drew a very impressive 1,942 players, which should put to rest any lingering doubts the WSOP has over eliminating the $1,000 buy-in events in favor of $2,000 or $2,500 buy-in tournaments. The total prize-pool is just a shade under $4.5 million, compared to the $3.9 million prize-pool from the most well attended $1k tournament. This is the final WSOP tournament before the Main Event gets underway on Monday July 5th, which could have helped to increase the number of entrants for the event. Remember you can bet on the winner of the WSOP Main Event at most Sports Betting sites online. You might even get a price for the once Aced – now Carbon Poker – Pro, Jamie Gold. But you might be best keeping your money. 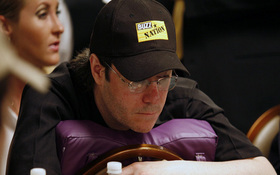 This entry was posted on Saturday, July 3rd, 2010 at 10:49 am and is filed under Poker News. You can follow any responses to this entry through the RSS 2.0 feed. You can leave a response, or trackback from your own site.